Nanotechnology, the cutting-edge research field that explores ultrasmall materials, organisms, and devices, has now been graced with the largest, most sophisticated, and most accessible university research facility of its kind in the U.S.: It is the new $400 million MIT.nano building, which will have its official opening ceremonies next week. The state-of-the-art facility includes two large floors of connected clean-room spaces that are open to view from the outside and available for use by an extraordinary number and variety of researchers across the Institute. It also features a whole floor of undergraduate chemistry teaching labs, and an ultrastable basement level dedicated to electron microscopes and other exquisitely sensitive imaging and measurement tools. The 214,000-square-foot building, with its soaring glass facades, sophisticated design and instrumentation, and powerful air-exchange systems, lies at the heart of campus and just off the Infinite Corridor. It took shape during six years of design and construction, and was delivered exactly on schedule and on budget, a rare achievement for such a massive and technologically complex construction project. At the heart of the building are two levels of clean rooms — research environments in which the air is continuously scrubbed and replaced to maintain a standard that allows no more than 100 particles of 0.5 microns or larger within a cubic foot of air. To achieve such cleanliness, work on the building has included strict filtration measures and access restrictions for more than a year, and at the moment, with the spaces not yet in full use, they far exceed that standard. All of the lab and instrumentation spaces in the building will be used as shared facilities, accessible to any MIT researcher who needs the specialized tools that will be installed there over the coming months and years. The tools will be continually upgraded, as the building is designed to be flexible and ready for the latest advances in equipment for making, studying, measuring, and manipulating nanoscale objects — things measured in billionths of a meter, whether they be technological, biological, or chemical. Many of the tools and instruments to be installed in MIT.nano are so costly and require so much support in services and operations that they would likely be out of reach for a single researcher or team. One of the instruments now installed and being calibrated in the basement imaging and metrology suites — sitting atop a 5-million-pound slab of concrete to provide the steadiest base possible — is a cryogenic transmission electron microscope. This multimillion dollar instrument is hosted in an equally costly room with fine-tuned control of temperature and humidity, specialized features to minimize the mechanical and electromagnetic interference, and a technical support team. The device, one of two currently being installed in MIT.nano, will enable detailed 3-D observations of cells or materials held at very low liquid-nitrogen temperatures, giving a glimpse into the exquisite nanoscale features of the soft-matter world. Almost half of the MIT.nano’s footage is devoted to lab space — 100,000 square feet of it — which is about 100 times larger in size than the typical private lab space of a young experimental research group at MIT, Bulović says. Private labs typically take a few years to build out, and once in place often house valuable equipment that is idle for at least part of the time. It will similarly take a few years to fully build out MIT.nano’s shared labs, but Bulović expects that the growing collection of advanced instruments will rarely be idle. The instrument sets will be selected and designed to drastically improve a researcher’s ability to hit the ground running with access to the best tools from the start, he says. 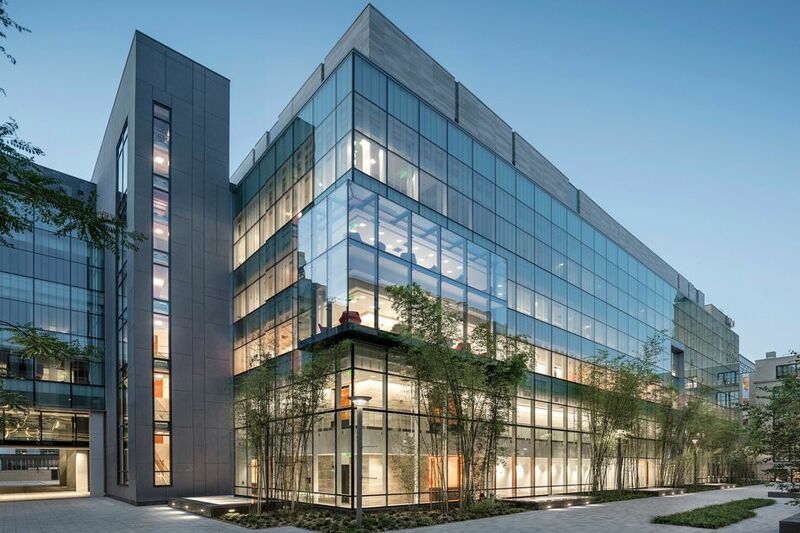 Once MIT.nano is fully outfitted, over 2,000 MIT faculty and researchers are expected to use the new facilities every year, according to Bulović. Besides its clean-room floors, instrumentation floor, chemistry labs, and the top-floor prototyping labs, the new building also houses a unique facility at MIT: a two-story virtual-reality and visualization space called the Immersion Lab. It could be used by researchers studying subcellular-resolution images of biological tissues or complex computer simulations, or planetary scientists walking through a reproduced Martian surface looking for geologically interesting sites; it may even lend itself to artistic creations or performances, he says. “It’s a unique space. The beauty of it is it will connect to the huge datasets” coming from instruments such as the cryoelectron microscopes, or from simulations generated by artificial intelligence labs, or from other external datasets. The chemistry labs on the building’s fifth floor, which can accommodate a dozen classes of a dozen students each, are already fully outfitted and in full use for this fall. The labs allow undergraduate chemistry students an exceptionally full and up-to-date experience of lab processes and tools. The building itself was designed to be far more open and accessible than any comparable clean-room facility in the world. Those outside the labs can watch through MIT.nano’s many windows and see the use of these specialized devices and how such labs work. Meanwhile, researchers themselves can more easily interact with each other and see the sunshine and the gently waving bamboo plants outdoors as a reminder of the outside world that they are working to benefit. Those who walk through the building’s sunlight-soaked corridors and galleries will notice walls surfaced with panels of limestone from the Yangtze Platform of southwestern China. The limestone’s delicate patterns of fine horizontal lines are made up of tiny microparticles, such as bits of ancient microorganisms, laid down at the bottom of primeval waters before dinosaurs roamed the Earth. The very newest marvels to emerge in nanotechnology will thus be coming into existence right within view of some of their most ancient minuscule precursors.